When I was growing up, my mother never cooked. Breakfast was Pop Tarts, Toaster Strudel, or dry cereal. Lunch consisted of what she called “two foods” , where we could pick any two items from a list including canned fruit, canned vegetables, canned soup, string cheese, yogurt, crackers, or more cereal. Dinners were Kraft Macaroni & Cheese, Hamburger Helper, or Ramen noodle soup. Dessert was a fun sized candy bar that we always had in stock. The menu was definitively underwhelming, but how much can I blame her? Her mother didn’t cook either! My grandma’s idea of “soup” is a bag of frozen mixed veggies boiled in water until COMPLETELY soft and mushy. That’s it. It wasn’t until I was 15 that I decided to break the cycle and start teaching myself how to cook. 8 years later, my mom has added a few skills to her repertoire. She now assembles salads on a regular basis and can cook up a few things on the grill. She can make spaghetti, although we are still working on the whole al dente thing. I jokingly asked her the other day why she had never taught me how to cook. Her sassy and perfect response? “I taught you how to read. Look! Now you can read recipes!” Touche, mom, touche. If you are reading this blog, I will assume you know how to read. If you can read, you can read a recipe. That is the foundation of learning to cook. Now it's time to add a slightly more complex skill to your kitchen arsenal which will making providing for yourself and your family faster, easier, cheaper, and maybe even more delicious! Introducing substitutions. While reading recipes (reading in general) is a valuable skill when learning how to cook, recipes have their shortcomings. Mainly, that they are specific. Does having an allergy, a dietary restriction, or a dislike of a certain ingredient mean you cannot use that recipe? What if you are halfway through cooking dinner when you find you don’t have everything you need? Must you make an emergency run to the store? Hopefully not! This is where substitutions come into play. Texture – I frequently use raw eggs to bump the protein in my smoothie bowls rather than some type of protein powder. Being that eggs are wet and protein powder is dry, I have to adjust the other smoothie ingredients (reduce amount of almond milk) with texture in mind so that it remains thick and delicious rather than runny. If the texture is too different, it may not be a doable substitution! Think subbing eggs for protein powder in a recipe for granola bars or cookies… not happening. Convenience – You are halfway through cooking Tilapia with Mediterranean Tapenade when you look in the pantry for the jar of Kalamata olives that you KNOW you picked up last week, only to return empty-handed. The fish is almost entirely cooked through and you don’t have time to run through the store before it’s done! What else could provide a juicy bite and salty flavor to the tapenade you are prepping? Maybe you have a jar of artichoke hearts, sundried tomatoes, cornichons, or capers on hand. Crisis averted! Knowing how to substitute ingredients makes cooking and baking much less stressful! Price – When I was shopping for today’s tart, I was a little hesitant to spring for a $6 bag of ground almonds at Trader Joe’s. Instead, I got an equal amount of ground flaxseed meal for $2.50! The texture and taste in the tart’s crust will be similar, and it was just as convenient for me to grab one bag off the shelf versus the other. See how it all works together?!? 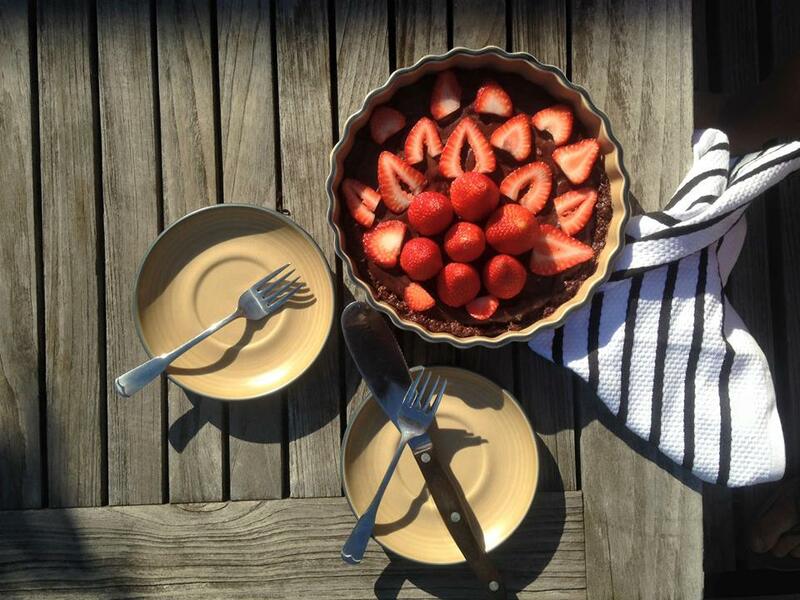 Now that you are equipped with some new substitution skills to save you time, stress, and money, I will break down where I used substitutions in Bakerita’s No Bake Raspberry Chocolate Tart to create this delicious Dark Chocolate Strawberry Tart! - The original recipe calls for almond flour in the crust. I chose a ground flaxseed over almond flour to get a lower price. Both ingredients have a similar texture and nutritional makeup. This was a great substitution! - Bakerita’s tart uses coconut oil in the crust, and I had JUST run out. Since I am not a vegan, melted butter worked great for me. I loved that I got both the nutty, grassy butter flavor from the crust and the slightly tropical flavor from the coconut cream in the ganache! - The original tart was a chocolate raspberry flavor. Sounds good, but I go CRAZY over chocolate covered strawberries! I used strawberry preserves and strawberries over raspberry preserves over raspberries. Easy. And here is the resulting, absurdly decadent dessert! In a small bowl, mix ground flaxseed, cocoa powder, melted butter, and maple syrup with a fork. Pour crust into greased tart pan or pie pan and spread into a thin layer along bottom and sides of pan. Place chopped dark chocolate into a medium bowl. Gently boil coconut cream in a small saucepan over medium heat. When the cream starts boiling, pour over chopped chocolate. Let sit for one minute, then stir until chocolate is completely melted. Add preserves to ganache, and pour filling into crust. Let tart set up in fridge for at least one hour or until ready to serve. Garnish with strawberries immediately before serving.